China seems determined to rise more and more with its impressive engineering feats. China already has world’s second-tallest skyscraper and the highest bridge and now soon highest skybridge is going to add in this list. Named as “The Conservatory”, it will sit astride four 250 m (820 ft) high towers. With 300 m (984 ft) long “horizontal skyscraper”, it will hold the world record of the highest sky bridge linking the towers. Currently under construction in China’s third largest city Chongqing, it intends to break all the records and dethrone the Marina Bay Sands in Singapore. 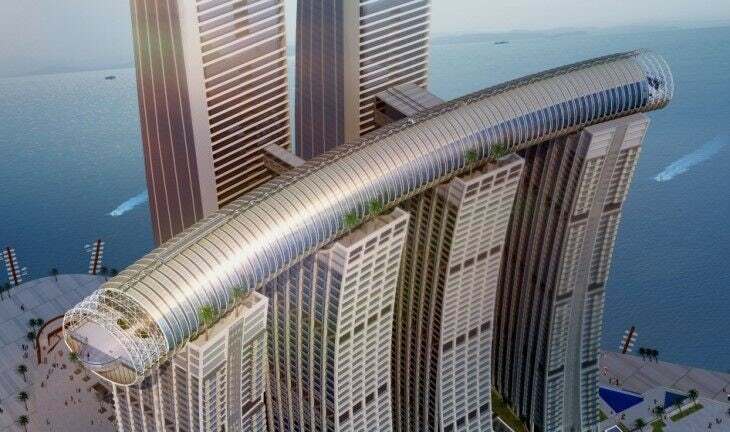 This Raffles City Chongqing project is headed by the architect Moshe Safdie and it will have 134,000 sq m of homes, shops, offices, entertainment, transportation links and a public park. This highest sky bridge in the world, is being built at the conflux of the Yangtze and Jialing rivers. It is also linked to an adjacent pair of 350 m (1,148 ft)-tall towers by a couple of smaller sky bridges. It has about 10,000-square-metre surface space which includes an infinity pool, an observation deck, sky gardens, bars, and restaurants. It comprises a steel structure weighing 12,000 tons and with 3,200 pieces of glass and 4,800 aluminum panels. The project is also environmentally friendly, as measures like optimizing shades to reduce heat, an efficient irrigation system, an effort to recycle construction waste, and the use of partly-recycled building materials were taken. The project is also slated for LEED Gold (a green building standard). Construction on this architectural and engineering marvel is almost 80% complete and it will open in phases from 2Q 2019. What’s Driving the Future of Autonomous Cars and Highways?